Not really sure how to sum up the fifteen year-old Toronto Raptors. By the numbers, this is a totally unremarkable franchise- just five seasons with a record of .500 or better, never eclipsed 47 wins (done twice) and five postseason appearances (11-20 playoff record). But this organization deserves to be thought of as more. More appropriately, its fans, some of the NBA’s best, deserve more. This is a group that’s seen Isiah Thomas actually make GOOD choices as GM (in the draft, at least), Vince Carter (when he gave a crap) create some of the greatest highlights we’ve ever seen, Tracy McGrady show glimpses of his potential, the end of Hakeem Olajuwon’s career, Vince Carter (when he didn’t give a crap) egregiously urinate on his home fan base, and Chris Bosh telegraph his intentions to blow town. This fan base was on the right side of VC’s other-worldly 2000 dunk contest performance and on the wrong side of Allen Iverson’s 2001 Eastern Conference Semifinals, Kobe’s 81 and “Hedo Turkoglu: Free Agent”. In the most complimentary way possible, it’s tough to find a team that’s accomplished less but meant more to the NBA in the past decade and a half. 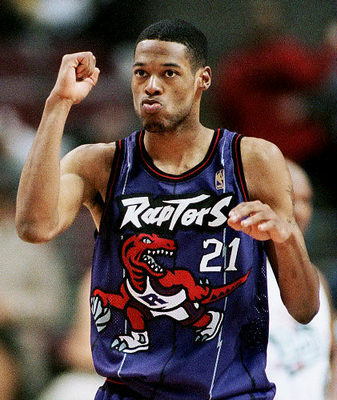 The Raptors’ first-ever draft pick, Stoudamire made an immediate impact in Toronto. After averaging 19 ppg and 9.3 apg, along with 4 boards per game (not bad for 5’10”) in his 1995-96 Rookie of the Year campaign, Stoudamire produced an equally fantastic sophomore season, putting up 20 ppg, 8.8 apg and 4.1 rpg. Despite his great production, he was the centerpiece of a trade that landed him with his hometown Portland Trailblazers midway through his third season. This deal should be fondly remembered as the epitome of “selling high”, although the package Raptors received in exchange for Stoudamire (Kenny Anderson, Alvin Williams, Gary Trent and a pair of forgettable #1s) didn’t quite set the world on fire. While he put up some impressive stats, it should be noted, however, that he shot 41.5% from the field, although this was likely a function of playing NBA at 5’10”. On the wings of his brief, good-but-not-great run in Toronto, Stoudamire remains the PG standard for the Raptors. Jose Calderon has shown flashes (10 ppg, 6.7 apg in 291 games; 12- 8.6 over the past two seasons), but has yet to consistently put up big numbers or contribute to a winner. He’s mounting a challenge to Stoudamire’s status as the Raps #1 all-time PG, but needs to put up another couple of solid seasons. Sorry, Raps fans! I didn’t want to do this to you, but I really had no other choice. Doug Christie (14.2 ppg, 4.6 rpg, 3.8 apg in 314 games) and Jalen Rose’s 177-game run (16.2- 3.4- 3.4) were less-than-inspiring. Hope you're enjoying the accompanying visual though! 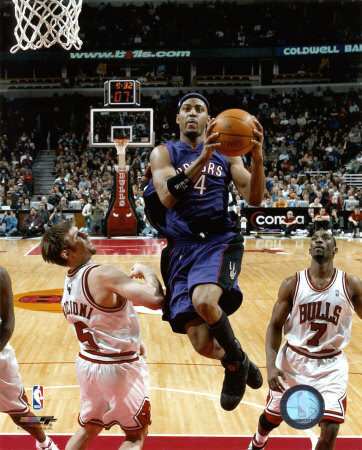 Vince Carter was the first “superstar” in franchise history, and took the Raptors to within a buzzer-beater of the East Finals, his (and the Raps’) highwater mark to date. In his time in Toronto, Carter won the 1999 Rookie of the Year award, made five All-Star teams, delivered the greatest-ever dunk contest performance in 2000 and, when he was in “Half Man, Half Amazing” mode, produced some of the greatest in-game highlights the NBA’s ever seen. He also remains the franchise’s leader in points, with 9,420. Long before LeBron publicly took a steaming dump on Cleveland, VC was incessantly jerking the fans of Toronto around, first by insisting on attending his UNC graduation ceremony on the morning of Game 7 of the 2001 Eastern Conference Semifinals (good thing he didn’t have a big day ahead at his seven-figure-salary job), and most notably by admittedly tanking the 2004-05 season in an attempt to orchestrate his exit, thus forcing the team into a pennies-on-the-dollar deal with the Nets. And I won’t even get into the times he avoided contact in the lane, jacked up fadeaway 3s to avoid even entering the lane, or hit the deck (see photo) because of phantom snipers that seemed to follow him around. 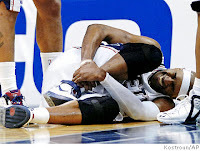 Vince Carter’s treatment of the fans of Toronto: sponsored by Summer’s Eve. As you may have guessed, there’s not a whole lot to work with here. But with that said, there’s some significance to this pick. While he’s hardly a great player, the long-time swingman is as much the face of the Raptors’ organization as anyone. Mo-Pete’s played more games than anyone with Toronto (542), has hit at least 247 more 3-pointers (801, Carter’s #2 with 554) than any other Raptor, and is third in franchise history in points. This spot should be Peterson’s for the next year or two, but should be transferred to former #1 pick Andrea Bargnani, who developed into a pretty nice player (last season: 15.3 ppg, 5.3 rpg, 45-83-41 FG-FT-3-pt; career: 12.4- 4.3, 42-83-38), but one might want to look into snatching a rebound or averaging multiple assists per game. Statistically, Donyell Marshall is actually tops this list, with solid scoring (13.8 ppg) and rebounding (8.7 rpg) numbers, and excellent shooting accuracy (45.7%, 41% 3-pt). 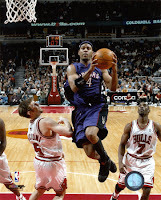 A young Tracy McGrady (11.1 ppg, 5.5 rpg in just under 25 minutes/game) also got a look, but had yet to fully develop. 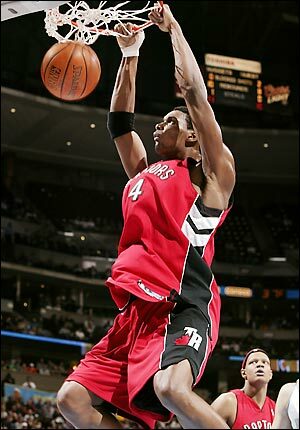 Before running off to be LBJ and D-Wade’s caddy, Chris Bosh was arguably the best player in Raptors’ history. He’s made the past five All-Star games, averaged better than 22-10 three of the past four seasons (including last year’s excellent 24- 10.8 free agent audition), and ranks first in franchise history in minutes, rebounds and blocks, and secod in points. Individually, Bosh can do virtually anything on the floor, and did a great job of improving and developing his all-around game in his first seven seasons. Thing is, as good as Bosh has become- and he’s an excellent player- he’s not a superstar or a true “franchise player”, as evidenced by the fact that during his seven-year stint in Toronto, the Raptors only finished .500 better twice, never won more than 47 games and made the playoffs twice, winning three of eleven postseason games. While Bosh was a clear and easy winner, a couple of other guys worth mentioning here are Antonio Davis, who averaged a near-double-double (12.9 ppg, 9.2 rpg) in four years (three of them above .500) with the Raptors, and Charles Oakley (8- 8 in 208 games) because he scares me. A good choice based on the way his post-Toronto career has played out, but Camby was only a solid-but-unremarkable young player with the Raptors. The fact is, “Raptors’ center” is a safe bet to be one of the weakest positions in this entire series. Only two guys have played more than 150 games in the middle for the Raps- Oliver Miller (159) and Rasho Nesterovic (151). Only two centers have averaged double-digit points in their Raptor careers- Camby and Keon Clark (10.5 ppg in 127 games), while none have averaged more rebounds than Camby’s 6.8. So, yeah, Camby did go on to have a long and productive NBA career, but based on his 126 decent games with the Raptors, he’s just the tallest midget in this circus. I like C- Marcus Camby style. It is so great.